USQC’s consulting services consist of partial or full turnkey assistance in achieving ISO, API or OHSAS certification(s) and compliance, backed by a robust electronic management system and processes. 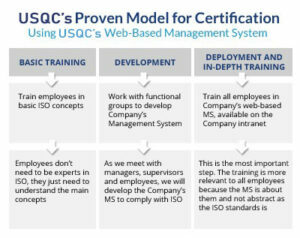 USQC provides expert guidance at every step, from selection of a registrar, to helping you write standards-compliant procedures, implementing a quality management system (QMS), EMS or ISMS, and conducting internal audits. Whether or not you have a quality assurance department or an established management system, we can work with your Project Manager to make your sought-after standards certification process is a successful one. Based on satisfied clients who have obtained international standards certification, we have devised an approach that will help you achieve your certification objectives. We will also assist you in implementing a sound and effective Electronic Management System that will foster continual improvement and customer satisfaction. We start by working with your process or departmental groups through a series of process mapping sessions that allow us document an accurate representation of your core business competencies. We investigate inputs and outputs, interactions within core processes, as well as support processes and identify process owners to generate a full, actionable picture of how your organization works. These deliverables are the result of meetings and interviews, and they typically go through 2 or 3 review phases before final approval. We approach the consulting process for each standard in a way that reflects both the requirements of the standard, and the manner in which your business operates. This helps you to get the most value from the improvements that are possible through compliance: improved efficiency, greater productivity, and world-class management of quality, safety, environmental and/or information security systems. The end result? A comprehensive engagement that injects concrete competitive advantages into the very DNA of your organization, its products and services. USQC has honed its expertise by consulting, auditing and training organizations in various industries for ISO, API, OHSAS and SEMS compliance. That experience – and the proven approach we’ve developed – translate into a track record that has seen 100% of our clients attain their certification goals and business objectives. We have 100% success rate in helping companies obtain ISO 9001 or ISO 27001 certification. Our Proven Model for ISO 9001, API Q1, API Q2, ISO 27001, ISO 14001, OHSAS 18001, SEMS consulting creates a real sense of ownership within your organization. Minimize implementation costs: Our consulting services paired with simultaneous deployment of your Web QMS will give you the best bang for your buck! Minimize employee time spent on ISO/API/SEMS/OHSAS clerical functions by using our online applications. Improve your processes when your management system software becomes more visible and available. Integrated Services: We provide consulting, internal audits and training, all with the same winning approach. Why Partner with USQC ? Our approach and attitude are our best traits that help create a great rapport with our clients (see client testimonials). We strive to look at things from the client’s perspective, working on making things smarter, not harder. Our attitude is always humble, never forgetting that the client is the expert in what they do and that we are just there to help them effectively achieve their certification and compliance goals and implement sound electronic management systems. Assigning a Quality Management System Consultant and dedicated Technical Writer for your project. Establishing a Gantt chart to be updated and followed throughout the project. Maintaining constant communication: physically, by phone, e-mail or online conferences. Issuing weekly reports including a summary of weekly accomplishments, project look-ahead and risk areas.